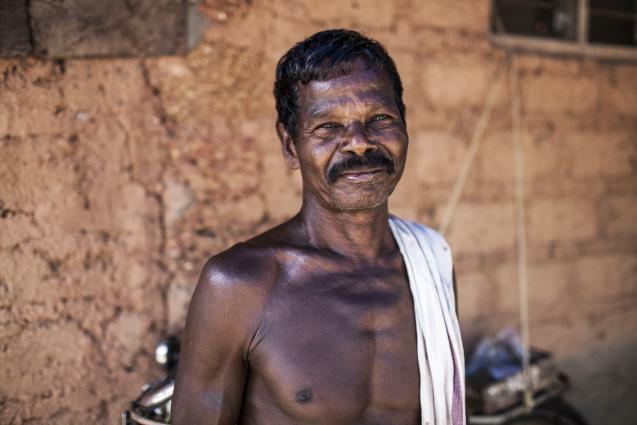 Planted across his one acre of land in Brahmavur village in Udupi district, are Dogu Koraga’s most prized possessions. These are 30 coconut trees, 30 banana plants, 30 aracnut trees and over 50 jasmine plants. In between grow sweet potatoes, brinjal, beans and biter gourd. Rain or sunshine, Dogu is up at daybreak, tending to them lovingly. Not only does he water each plant himself after drawing water from his well, Dogu only uses self-made manure. “It is because of these trees that I am self sufficient today. I am not dependent on anyone, not even my sons,” said Dogu proudly. Although Dogu always dreamt of cultivating his own land, he was reconciled to tilling somebody else’s land to earn a living. In 2003, when the Koraga Federation’s movement for lands rights led to allocation of land in Udupi district, Dogu’s dreams came true. It took him one year of hard physical work to make his piece of land, overrun by brambles and weeds, worthy of cultivation. Jasmine plants, given by the Federation, were the first to be planted. As the money earned through the sale of the jasmine flowers increased Dogu planted vegetables, coconut, aracnut and banana. Dogu is uneducated but has made up for his lack of literacy by hard work and a determination to succeed. It is not wonder that his is considered a model farm and spoken about in glowing terms at community meetings by the Koraga Federation. Ashok Shetty, SGA coordinator, who saw the land before it was given to Dogu said not many of them had thought the transformation was possible. “The credit goes to Dogu. It was not easy to toil on this land without help. But Dogu showed it was possible and this is why the Koraga Federation and SGA have tried to get other community members who received land to follow his example. But we have not been able to scale up the model farm yet,” informed Shetty. Even Dogu is keen others in the community become economically independent by cultivating their land. “It is much better to work on your land than work as a headloader or daily wage labourer. This gives the opportunity to become your own master,” he stated. Although Koragas are not traditional agriculturists, Dogu grabbed the chance to become the master of his own destiny once he received land. His single-minded dedication led him to live away from his family for some years. Only recently, one of his three sons has come to stay with him. So involved is Dogu in improving his produce that the only programme he watches on the black and white television brought by his son is related to agriculture. “This farm has given me so much. I may not have any savings, but I also don’t have any debts. I am happy and live a life of dignity,” he stated.